Mr. Horton’s Year’s Best is a long-running and prestigious anthology series, and Emily and Margaret’s stories will appear alongside others by BCS authors Aliette de Bodard, Caroline M. Yoachim, Genevieve Valentine, and Marissa Lingen. The anthology is due out early next year. BCS in Steampunk Anthology, Again! A story from BCS has been selected by Ann and Jeff VanderMeer to be reprinted in the latest volume in their series of steampunk anthologies. “Salvage” by Margaret Ronald, from BCS #77, will appear in Steampunk Revolution, which will be released by Tachyon this fall. Margaret will be sharing these pages with such other great authors as Jeffrey Ford, Catherynne M. Valente, Cherie Priest, and more. “Salvage” features the same characters as Margaret’s earlier story “A Serpent in the Gears,” from BCS #34, which appeared in the VanderMeer’s previous steampunk anthology Steampunk Reloaded. 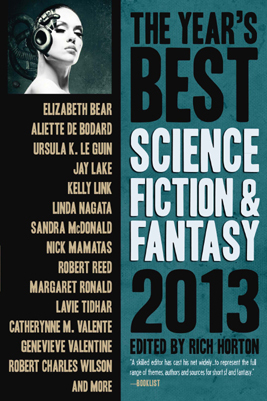 “Walls of Paper, Soft as Skin” by Adam Callaway, from BCS #73, has been chosen to appear in the anthology Year’s Best Dark Fantasy & Horror: 2012, edited by Paula Guran. This anthology, published by Prime Books, will also include Catherynne M. Valente, Gene Wolfe, and BCS author Yoon Ha Lee. Congratulations to Adam! “Walls of Paper” is a great, creepy short piece of dark fantasy, and Prime Books’s Year’s Best are great anthologies. A BCS story and several past BCS authors will be appearing in The Mammoth Book of Steampunk, a huge collection due out next year. Margaret Ronald’s story “A Serpent in the Gears,” from BCS #34, will be in the anthology, along with reprint stories by BCS authors Genevieve Valentine, Cat Rambo, Matthew Kressel, and Megan Arkenberg, and new stories by BCS authors E. Catherine Tobler and Aliette de Bodard. A fine collection! Look for it next year. 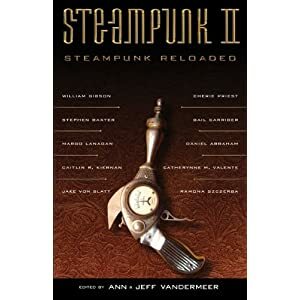 In conjunction with Genevieve Valentine’s story “Bread and Circuses” in BCS #55 and the release of Ann & Jeff VanderMeer’s new anthology Steampunk Reloaded, BCS is giving away a signed copy of Steampunk Reloaded! Post a comment on “Bread and Circuses” in the comments thread on the BCS Forums, and you’ll be entered in a drawing to win a copy of Steampunk Reloaded signed by the VanderMeers. This new anthology features Daniel Abraham, Caitlín R. Kiernan, Catherynne M. Valente, and one of Margaret Ronald’s stories from BCS. Read the complete rules for the giveaway here. Enjoy “Bread and Circuses,” and make sure you post your comment before the giveaway ends at midnight Wednesday Nov. 17. Good luck! In conjunction with Genevieve Valentine’s story “Bread and Circuses” in BCS #55 and the release of Ann & Jeff VanderMeer’s new anthology Steampunk Reloaded, BCS is giving away a signed copy of Steampunk Reloaded. To enter, post a comment on “Bread and Circuses” on the _BCS_ Forums, and that will enter you in a drawing to win a copy of Steampunk Reloaded signed by the VanderMeers. You must leave your comment in the BCS Forums comments thread that is for “Bread and Circuses.” Comments left anywhere else will not enter you in the giveaway. You must post your comment between midnight EST on Nov. 4 and midnight EST on Wednesday Nov. 17. Any comments before Nov. 4 or after Nov. 17 will not be eligible. Each person can be entered only once in the drawing, no matter how many comments you leave. You must be a registered member of the BCS Forums, and you must post your comment from that registered user name (otherwise we won’t be able to contact you if you win). BCS will conduct the random drawing and contact the winner. The VanderMeers will sign the copy of Steampunk Reloaded for the winner, and it will be mailed to the winner. If you have any questions, feel free to ask them here. Enjoy the story, and make sure you post your comment before the giveaway ends, at midnight on Wednesday Nov. 17. A story from BCS has been selected by Ann and Jeff Vandermeer to be reprinted in their new steampunk anthology. “A Serpent in the Gears” by Margaret Ronald, from BCS #34, will appear in Steampunk Reloaded, which will be released by Tachyon this Oct. Margaret will be sharing these pages with such other great authors such as Jeffrey Ford, Daniel Abraham, Margo Lanagan, and Catherynne M. Valente. Podcastle, the original podcast for fantasy short fiction, has podcasted a story from BCS: “The Tinyman and Caroline” by Sarah L. Edwards, from BCS #17. This podcast is part of Podcastle’s special theme during this month to podcast stories that originally appeared in online fantasy magazines. They’ve done stories from Fantasy, Abyss & Apex, Ideomancer, and BCS. We’re proud to have our fiction included among such other great online magazines. Check out Podcastle’s version of “The Tinyman and Caroline” here at Podcastle.org. Two BCS stories from last year garnered Honorable Mentions in Rich Horton’s anthology Unplugged: The Best of Online Fiction: “Architectural Constants” by Yoon Ha Lee, and “The Sword of Loving Kindness” by Chris Willrich. Congrats to Yoon and Chris! And thank you to Rich for his consistently positive reviews of BCS in Locus and his inclusion of us in this anthology.